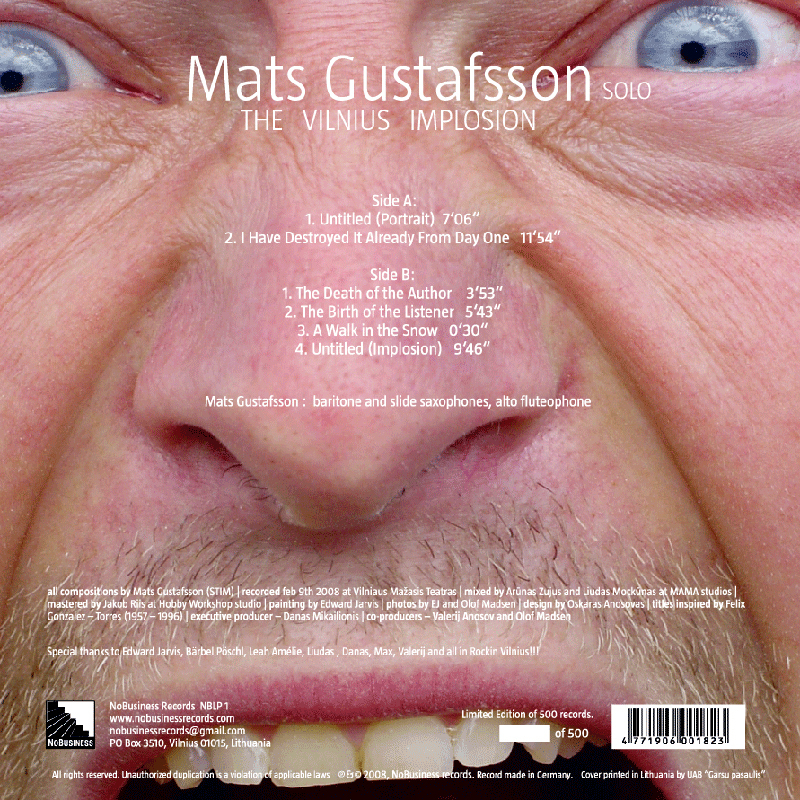 All compositions by Mats Gustafsson (STIM) * recorded feb 9th 2008 at Vilniaus Mažasis Teatras * mixed by Ar?nas Zujus and Liudas Mock?nas at MAMAstudios * mastered by Jakob Riis at Hobby Workshop studio * paintings by Edward Jarvis * photos by EJ and David Grubbs * design by Oskaras Anosovas * titles inspired by Felix Gonzalez – Torres (1957 – 1996) * executive producer – Danas Mikailionis * co-producers – Valerij Anosov and Olof Madsen. Special thanks to Edward Jarvis, Bärbel Pöschl, Leah Amélie, Liudas , Danas, Max, Valerij and all in Rockin Vilnius!!! 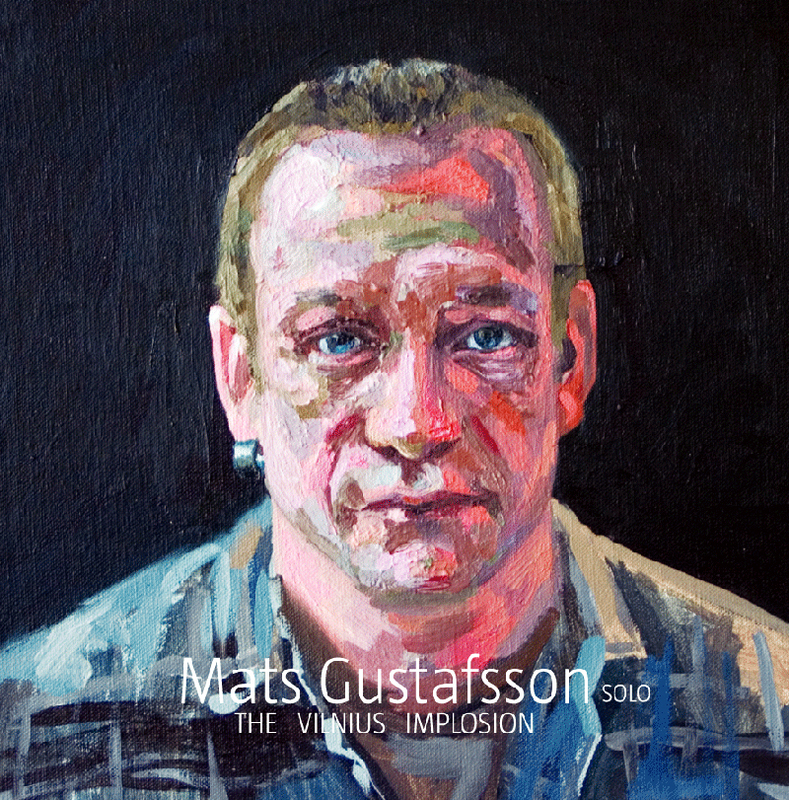 to the twin-engined quintet recording of The Vilnius Explosion released this fall by Lithuanian upstart No Business Records, The Vilnius Implosion provides a solid chunk of unmitigated Mats on baritone saxophone, alto fluteophone, and vicious slide saxophone shears. 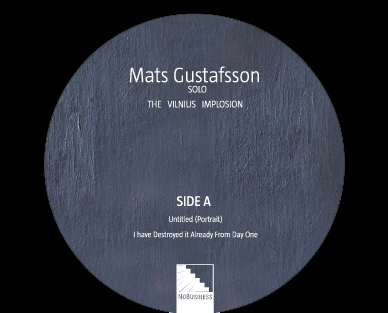 Though a self-confessed vinyl nut, far too few of Gustafsson’s releases are on vinyl, and No Business is nudging rectification by releasing this date on a single slab of wax in limited quantities. Though Gustafsson is by no means under-recorded, most of his recent output has focused on The Thing, his trio with drummer Paal Nilssen-Love and bassist Ingebrigt Håker-Flaten. 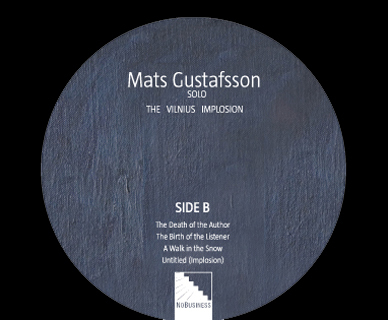 So while the Explosion features a quartet of Lithuanian musicians – reedman Liudas Mockunas, bassist Eugenijus Kanevicius, and drummers Arkadijus Gotesmanas and Marijus Aleska – with whom Gustafsson was unfamiliar with prior to his Lithuanian visit, so Implosion finds him in a somewhat rare solo context. It’s easy to forget that, with the rocking drive of The Thing (aided and abetted by a choice of tunes from Mongezi Feza, Don Cherry, and The Sonics) Gustafsson is a player whose language is based on pure sound, whether in nuanced fingerings of a slight phrase or room-panning cinderblocks and vein-popping, metallic overblowing. The opener, “Portrait,” for baritone, begins in delicate clicks and pops, slap-tonguing caresses and percussion that, through whispers and sighs, circle until Gustafsson carves out brays and screams – it’s here that the force of quietude and loudness appear as equals in tension and release, of small objects making their presence felt in an area equally imposing as that of thick sandblasted sections. Lines are quickly subsumed into broad strokes, an unsubtle energy that’s more defining action than the process of paces.